When most people think of Athens, Ga. two things come to mind: The University of Georgia and a world famous music scene. With favorites such as the B-52&apos;s and REM to call Athens home, Athens music has become more than just a small town with a few music venues for local bands. Bands are born here, strive here and become famous here everyday. With so many different venues, artists and genres present every weekend, it&apos;s hard to miss out on the experience of concerts in Athens. 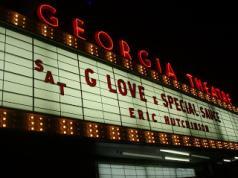 Last weekend I attended two concerts in two nights, seeing three of my favorite artists, (Citizen Cope, Eric Hutchinson and G. Love and Special Sauce). It really reminded me how amazing it is to live in such a diverse college town where some of most thriving music in the country lives and thrives. Each concert took on its own persona, but the one thing I found in all was that the crowd was not simply a "college student" fan base. My best friend&apos;s parents even came out with us Saturday night and they were by no means the only "adults" in the crowd. What makes Athens music so different that is draws bands from all over the world here? Do you have a stand out "ah-ha!" concert that made you realize that there is no place quite like the classic city?